Perfect gift or decor for many occasions or just because. 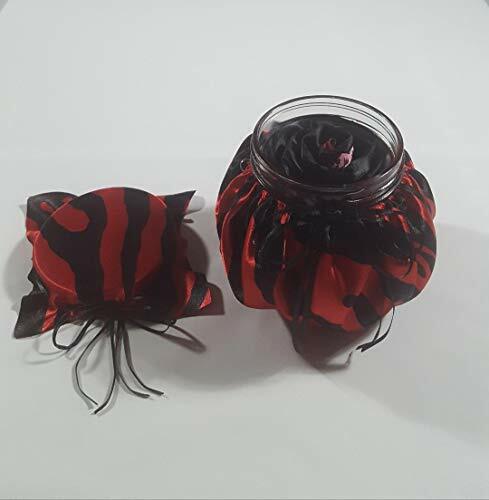 This handcrafted scented zebra print satin ribbon rose head room freshener is presented in a red and black zebra hand-stitched fabric covered decorative jar with a removable replaceable matching lid. Fragrance has been added to rose head to create a lovely aromatic scent. Simply remove lid to offer a fragrant means of refreshing a room's atmosphere. Replace lid. Scent should last for 30 days or longer. When aroma begins to fade, just add your own. My stunning one-of-a-kind gift presentation is completed with a "Thinking of YOU" enclosure card with each jar. If you have any questions about this product by P and P Floral Designs, Etc., contact us by completing and submitting the form below. If you are looking for a specif part number, please include it with your message.